Early this year, Sony announced three new members of a new lens line, the “G Master” line, to denote top end professional grade lenses. Two of them are the key pro-grade zoom lenses that are essential to high-end systems: the 24-70mm f/2.8 and the 70-200mm f/2.8, while also releasing a fast portrait prime in the 85mm f/1.4. Today I’m looking at the new standard zoom, the 24-70mm f/2.8 G Master (GM). 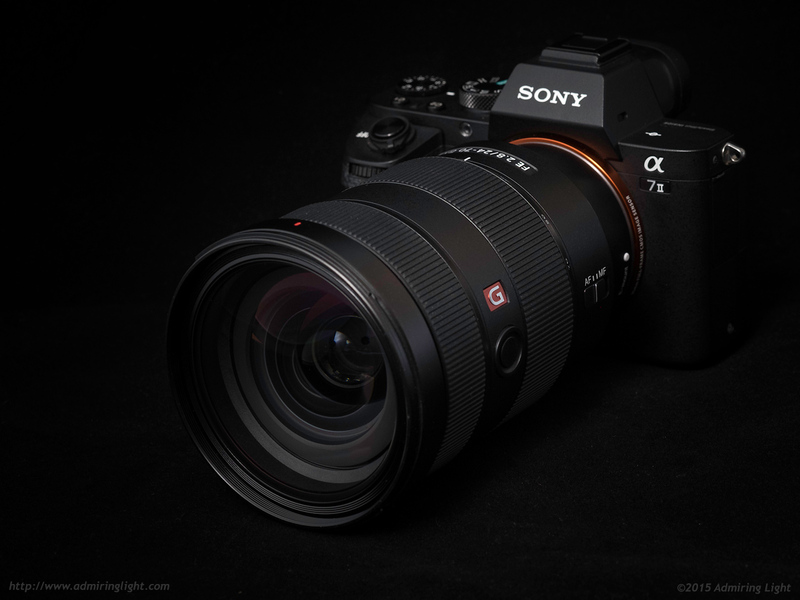 After the good, but not great performance of the slower FE 24-70mm f/4, hopes are very high that Sony has crafted a truly exceptional zoom lens this time around. It’s a big, heavy and expensive lens that retails for a shade under $2,200, but will the performance justify the cost and size? Let’s find out. The FE 24-70mm f/2.8 is, to put it mildly, big. It’s larger and heavier than Canon’s 24-70mm f/2.8L II and nearly the same size as Nikon’s 24-70mm f/2.8G. Tipping the scales at a hair under 2 lbs and measuring over 5 inches long, the 24-70mm GM is a beast of a lens. For those who are shooting professionally and need the speed in their standard zoom, it’s just part of the package, but the weight is noticeable and sometimes awkward. The base of the lens leaves enough clearance to keep the grip clear, so overall handling is fine, but if you’re carrying this in your hands all day long, you will begin to tire of it. Still, none of this is unexpected. There’s no free lunch with speed, and for the optical quality needed to perform well on today’s bodies, size is simply part of the cost of doing business with a lens such as this. 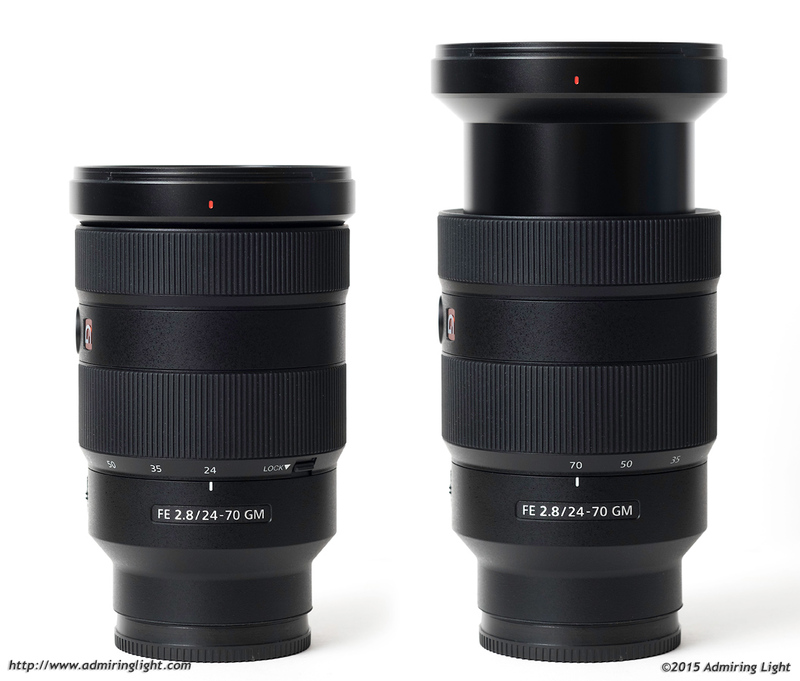 In line with its cost and target market, the 24-70mm f/2.8 is very robustly constructed. A mix of very high-end plastics and metals make up the exterior construction, and tolerances are very tight. It’s a very dense and very solid lens, with absolutely no flex anywhere on the lens, even when extended to 70mm. The inner lens tube extends around 2 inches towards the long end of the focal range, and there’s no wobbling, even at full extension. The zoom and focus rings are very well damped and feel extremely solid. This is a lens that feels like a professional tool. 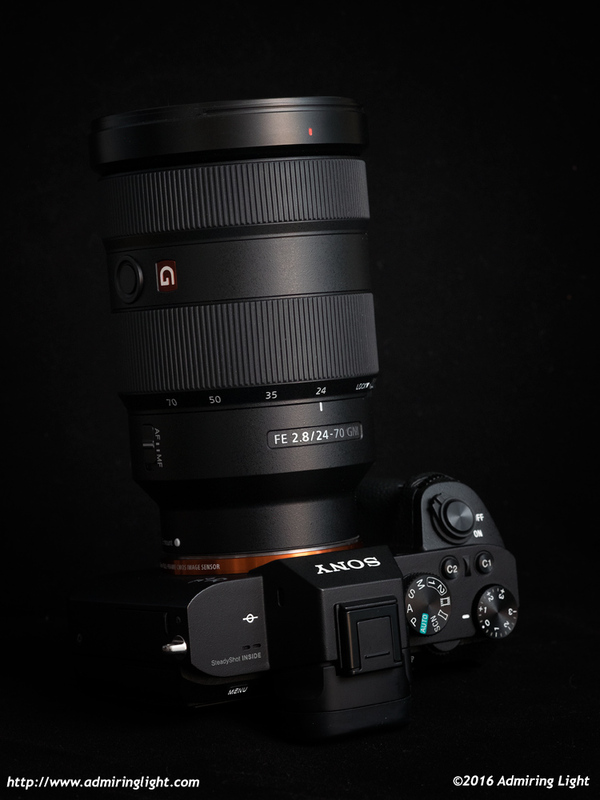 The lens is sealed against dust and moisture, and unlike earlier Sony lenses with weather sealing, there is a small foam rubber gasket at the lens mount. Unfortunately, it’s so short that it actually doesn’t make contact with the face of the lens mount, thus making it completely useless in practice. Why can’t Sony design a proper mount gasket? Still, gasket aside, the lens is impeccably assembled and wonderfully solid. The FE 24-70mm GM has a quick and quiet focus motor. In most situations, the focus locked very quickly and surely, with excellent accuracy. I did have some misses when shooting at very small apertures, however, where the camera would get confused with the deep depth of field and focus too closely, simply due to the way Sony focuses while stopped down. I still don’t know why Sony doesn’t do what every other manufacturer in the world does and focus wide open and stop down when making the exposure. Continuous Autofocus is plenty fast enough to keep up with the demands of event shooting at wider apertures, and while this sort of lens isn’t geared towards sports action, in good light, I think that it would track quite well on the newer bodies in these situations. One very nice feature on the 24-70mm f/2.8 is the close focus ability. The lens focuses as close as 0.38m, with a maximum magnification of around 1:4, which is quite good for a non-macro lens. This enables close up photography for flowers, large insects like butterflies and other detail type shots. It definitely makes the lens a more versatile thing to have in your bag. Thanks for confirming that your 24-70GM lens mount does not fully contact the A7RII lens mounting flange. I noticed the same on my 2nd day of shooting. I have reported this to Sony Pro Support several times over the last month with obsoletely no response from them! I definitely would not call it ‘PRO’ support. The touted ‘weather sealing’ was one of the main reasons I chose to buy this lens as I shoot primarily coastal landscapes in Hawaii. I would appreciate it if you could inform Sony of your findings about the lack of a true ‘Seal’ between the lens and A7RII lens mount. The lens is not truly ‘sealed’ as it was clearly advertised by sony. The only way to get Sony’s attention and acknowledgment of this flaw is to get as many users as possible to complaint about this issue. For $2200 they should offer to repair / modify or replace the seal on this otherwise exceptional lens. It’s a shame that sony can not get something so simple as a sub $1.00 gasket right the first time. This is the best 24-70 GM so far, quite impressive! Thanks so much for sharing! How would you rate this vs Fuji’s 16-55? It’s better. The Fuji was good, but didn’t really blow me completely away. I was very surprised at how good the 24-70 GM was. I was on the fence regarding this lens and decided to pass. The convenience of a standard zoom for the A7RII with a decent IQ was enticing for the convenience factor alone. However, the lack of IS and the “extending” design is a dealbreaker for me. My old Nikon 24-70 f2.8 VR G-lens had none of these limitations; I would have thought SONY would have stepped up to the overall sophistication and quality level other than just matching the price. The seal issue is another design and/or manufacturing flaw but the reported lack of response from SONY’s ironically labeled “Pro” support arm if true, would be yet another reason to stay far away. I really hope the company rebalance its priorities and focuses on Q/A more instead of overfunded creative marketing. Pingback: Sony G Master Lens 24-70mm Called "Exceptional"
Actually the best standard zoom is the canon 24-70 2.8 II. I use this via meta ones on my A7R II. But the Images I see using the Sony compared to my canon are not in the same universe. The Sony is good but not in the prime like sharpness class of its canon counterpart. The Canon 24-70 2.8 II is a legendary performer that has not yet been matched much less out performed. Considering I paid to rent the lens to write a review on it, I can most assuredly say this isn’t a marketing campaign. It’s a stellar lens. Having not put it head to head with the Canon, I can’t say which is better, but the Sony is the best standard zoom I have used. I won’t buy it – it’s too expensive for me and too big for my type of shooting and my desires, but it is truly excellent. Lens rentals did a test with the Sony, Canon and Nikon and the Sony and Canon were at the top and very comparable. Tested my 24-75 Canon and had good results at 24mm but at 35mm and more the extreme corners presented some smearing effect in combination with my Sony A7r2. Maybe some extreme field curvature or a bad copy. Didn’t have the possibility to test the new Sony 24-70 f2.8 but ill do it. For the moment in a landscape mode and must confess that I’m very happy with the Contax 30-70 C/Y. But use most of the time the Sony 16-35mm (Loxia 21mm and Samyang 14mm for night shots). Pingback: ?? ?FE 24-70mm F2.8 GM???????????????????????????? | ???????????? ?